The 5 essentials of pool maintenance described here will give you a basic understanding of how your pool functions. Pool care can be simple when you have a plan for routine maintenance and use the right Bioguard products. Each Pool maintenance key is very important. Consider each key, as a simple, preventative maintenance step. The filter is one of your most important pieces of equipment. It removes both visible debris and most microscopic matter. Generally, a filter should be backwashed (the removal of material trapped on or in the filter media) when the water pressure in the filter reaches 8 to 10 psi above normal. (Check manufacturer’s guidelines.) Because backwashing does not remove oils and deeply embedded debris, every filter needs to be chemically cleaned regularly. Your BioGuard Dealer can help you establish a filter maintenance program. Every pool has characteristics that must be regularly measured and adjusted. Most important are the pH and the level of active sanitizer. By testing these two factors at regular intervals, you’ll understand how bather load, weather and product application affect the water. Test your pool water two or three times per week. Also, take a sample to your BioGuard Dealer when you open and close your pool, and every four to six weeks during the season. This will help you maintain proper water balance and greatly reduce the potential for problems. Provide brilliant, sparkling water that’s inviting. You may exchange or return merchandise for a full monetary refund, less shipping charges, within 30 days of purchase. You must have the original reciept for return. Product mus be unused, like-new condition, and 100% saleable condition in the original manufacturing’s packaging. Special Order items are not returnable. Special order parts/products may be difficult to obtain. All dates set by Bennington Pool & Hearth are tentaive. Things such as back-orders, out of stocks, direct factory shipments can add to lead time of said part or product. Remember we do not control the manufacturers or the shipping companies. Also any returned products will be charged a 25% restocking fee. Credit Card Refunds: If original purchases payment was made by credit card , applicable refunds will be applied to the same credit card used for the original purchase. If the credit card is no longer active and available, then store account credit will be issued to the customer’s account as listed on the original purchase. Cash Refunds: Cash refunds will only be made if the (1) original purchases payment was made with cash and (2)the original purchase totaled $50.00 or less. For refunds in excess of $50.00, Bennington Pool & Hearth will issue a company check. Office manager will will issue check within 3 business days. Check Refunds: If original purchases payment was made by check, store will issue you company check. Please note that refund checks will be processed once the original customer’s check has been confirmed check clearing. Once the original check has cleared, company office manager will issue company check with in 3 business days, and will mail to original purchasers address. For everyone’s safety and protection, we cannot and will not accept any returns on chemical products. This ensures no product has been tampered with. Bennington Pool & Hearth reserves the right to inspect returning items. 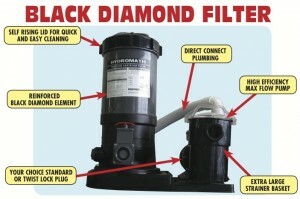 The 90 ft² Black Diamond Catridge filter is able to filter up to 25,000 gallons of water. 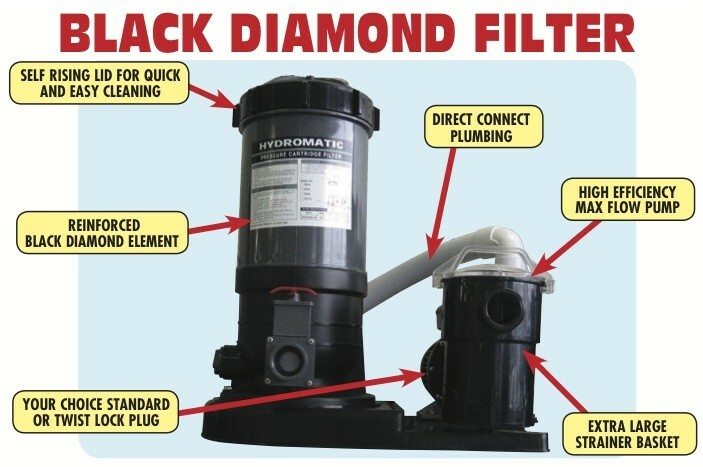 The Black Diamond cartridge filter system with the state of the art cartridge holds more dirt leading to longer filter cycles and less servicing. System comes with 1 HP pump & motor. This system comes with all filtration hoses, pressure gauge and two gate valves. *limited quantities. Sale price for in-stock systems only.